Directory of 48 South Dakota Turkey hunting lodges, guides and outfitters in South Dakota. We offer a limited number of archery turkey hunts from the middle of April until the middle of May. We have plenty of Tom's ranging in weight from 22 lbs to 28 lbs, with beards as long as 12 inches. We offer fully and semi guided Merriam turkey hunts. Hunters get a double tag which means you can shoot two Toms. Hunters also have the option of hunting with a bow or a gun. Most of our hunts are out of ground blinds, however, there may be a quick set up in brush or behind a tree. South Dakota offers a spring and fall turkey hunting season to both residents and nonresidents. The spring season application process opens in mid January with a late February deadline. The tradition start for the season is the second Saturday in April, running through the third Sunday in May. Here at Browns Hunting Ranch, we hunt the Merriam turkey. The Moreau River is home to large flocks of turkey, where we hunt both river bottoms and field edges. It’s not uncommon to see flocks of dozens of birds. We offer fully-guided or semi-guided hunts. Every year as spring returns, brings a heart racing sound of an old gobbler, strutting, and gobbling. When you hunt with us, you could see 25 or more different strutting gobblers in one day. You will be hunting over 50,000 plus acres of private and leased ground, hunting only the best creek bottoms and fields with an unbelievable number of turkeys. West River Turkey Hunting is hard to beat. We have seen several toms with trophy beards. Cedar trees provide excellent coverage for you and your guide to hide behind while calling in turkeys. We offer spring and fall turkey hunts. You can get more info about tags at South Dakota Game Fish and Parks. 3 day hunts available. The Hat Creek Outpost is a working cattle ranch located between Hot Springs and Ardmore, South Dakota. The property has over 15 miles of creek bottom habitat. Hat Creek has developed a reputation over the years as one of the premier locales for trophy deer in South Dakota and is endorsed by Bass Pro Shop. South Dakota has developed itself as the premiere pheasant hunting destination. However, South Dakota also contains an abundance of other birds to harvest including turkeys and a variety of breeds of waterfowl. While Cimpl Made Hunts specializes in guided pheasant hunting, we are also happy to accommodate you in your pursuit of other birds. If you are interested in either a guided turkey hunt or a guided waterfowl hunt, please CONTACT US. Semi-Guided Packages: 3 Day $1200.00 per gun; 5 Day $1650.00 per gun; 7 Day $2250.00 per gun. We have been guiding for Merriam Turkeys since 1985. Our success rate is over 98% on the first bird. Our turkey hunt is a 3 day hunt with a guide who can help you with the calling or point you in the right direction and pick you up later. 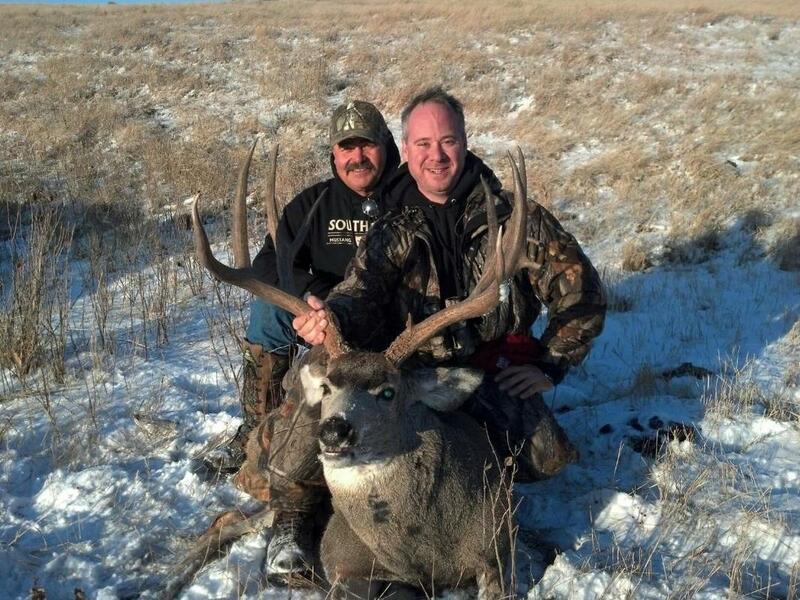 Dakota Ranch Outfitters offers big game hunting for mule deer, whitetail, antelope and turkey. We also offer upland game birds, which include pheasant and sharptail grouse. South Dakota big game rifle licenses are obtained by a lottery drawing system, with Archery Tags Guaranteed. We have leased 1200 acres of private land next to the Black Hills National Forest for Merriam Spring Turkey Hunting at Sturgis, South Dakota. Our lease is two miles from downtown Sturgis in the shadow of Bear Butte, a religious butte for the Lakota Sioux. Learn more about Dakota Wild Bird Hunts, Inc.
Every year our Spring archery turkey hunts get more popular. Double K is THE place to hunt Merriam's in South Dakota, if not the whole U.S. We own and have access to prime turkey hunting spots across 3 counties, giving you the choice of numerous locations and thousands of birds. We also know the birds well and can put you on the roost in the morning & evening, and in their path during the day. With the turkey population on our ranches coming in at over two thousand five hundred birds last fall, turkey hunting at Firesteel Creek Lodge is nothing short of amazing. We hunt turkeys several ways on our ranch, from heart pounding calling to the always effective spot and stock technique. We consider the Prairie Chicken a "trophy" bird. It can be hunted in only three states, so when you bag a "chicken," you become one of the few to do so in modern times. Sharptail Grouse, Hungarian Partridge, Bobwhite Quail, Mourning Dove, and Merriam Wild Turkey round out the upland birds available to our guests. Our waterfowl hunting is superb with Canada Geese and Mallards our most abundant fowl. The Black Hills hunt is done on National Forest or small private ranches. Lodging is usually is a local motel in Hill City SD. We have a variety of terrain that we can match to the hunter desires. The Prairie hunt take place on a 11,000 acre ranch North of Wall SD on the break of the Cheyenne river system. The Garnos Ranch provides all home cooked meals with this package. Experienced guides and trained dogs. Bird processing (cleaning and freezing). Transportation provided for guided hunting. Field lunch prepared and served. Lodges 20 to 24 hunters. All taxes included. Few outdoor experiences match the exhilaration and challenge of a traditional spring gobbler hunt. The sound of a gobbler’s excited calling as he steadily approaches, the harmonic puffing and feather snapping of an unseen bird and the first sight of the gobbler in full strutting display as he comes into view are unforgettable. Spring Merriam Turkey Hunting in the beautiful pristine Black Hills of South Dakota. Fully guided or semi-guided. True Merriam hunts No Hybrids Here! See Ray Eye and Jason Gilbertson of Winchester Turkey Revolution bag trophy Merriam’s on Versus TV with the legendary High Prairie Lodge & Outfitters. Outfitter Dave Ciani has been a professional turkey hunting guide for over 20 years. Dave has live trapped and transplanted turkey’s, worked as a Special Game Protector in law enforcement, taught adult education classes on calling, turkey hunting, the life cycle of turkey’s and taught elementary school children the ethics and life cycle, calling and hunting of turkeys. Dave puts the utmost importance on the ethics of hunting and is as much a teacher as he is a hunting guide. Turkey hunts are offered in three states including South Dakota, Kansas, and Nebraska. The beauty of being able to hunt these three states is the flexibility of being able to hunt three seasons from late March untill the end of May as well as being able to hunt three of the four main sub-species of turkeys. Missouri River Outdoors offers some of the best Merriam turkey hunting there is. South Dakota is one of the few states that offers the perfect habitat combination – thick vegetation, huge cottonwood trees and the riverbanks of the Missouri River – where Merriams thrive. And in recent years these big gobblers have been in abundance across the lowlands near the Missouri River. Contact Missouri River Outdoors today to book your turkey hunt of a lifetime. Oak Creek Outfitters has thousands of acres and thousands of trophy Merriam turkeys for you to hunt. If one bird is not enough, you have the option to get more tags for state land (and you can get tribal tags to hunt more birds as well). The archery season opens in April and ends in May. The shotgun season opens in April and ends in May. So choose your weapon, tags, and dates and we will provide the decoys and calling for you. If you have plenty of experience, you are sure welcome to do your own calling. Missouri River Ringnecks offers guided hunting services in and around Glenham, South Dakota. We will show you how to hunt pheasants, sharptail grouse, morning doves, and turkeys. Our prices include lodging and meals; our lodge can accommodate up to 16 hunters, and we offer the finest foods and beverages available. Each spring we have a very limited number of turkey tags available. Fully guided and scouted by the Prairie Sky Field Staff. Enjoy the wide open spaces of Western South Dakota as you pursue Mule Deer, Whitetail Deer, Pronghorn Antelope, or Merriam Turkeys on our private ranch. Our location along the Belle Fourche River, ample acreage to hunt, wildlife management efforts, and limited harvest ensure that you will have a great opportunity to harvest a mature buck. Much of this ranch has been in our family for over a century, and we know where the big bucks are! Rocky Ridge Retreat provides the perfect habitat for turkeys and our exceptionally high turkey population draws anxious hunters each year. Turkey hunts are available in both the Spring and Fall. Rooster Tales has the unique opportunity of obtaining licenses for Whitetail Deer and Merriam Turkey hunts. How do we do this? We have an abundance of tribal land that borders our property and will be working with the Rosebud Sioux Tribe to offer licenses. Most guests who come in for one of our guided Merriam turkey hunts agree, that the Rosebud is some of the best turkey hunting around. The abundance of birds and their very vocal characteristics set these hunts apart from most others. These hunts will likely be quite different than what you are used to. Without a doubt, turkey hunting in South Dakota is some of the best to be found in North America and we offer the best in South Dakota. With over twenty years experience guiding turkey hunters, I guarantee you action that few hunters have ever experienced. Whether you choose to hunt with gun or bow you will be assured of numerous sightings with multiple opportunities at longbeards. If you are looking for an extremely successful Merriam hunt and want to be in an area with true trophy-sized Toms, give us a call. We have harvested record book Toms over the past several years. Merriam Turkey Outfitter in South DakotaThe West River area of South Dakota is one of the few places in the country where you can chase large Merriam’s Turkeys. One of the benefits of hunting these amazing creatures in this area of the world is their wonderful taste brought about by the volume of agriculture in the region. Whether we are actively stalking a large group or calling in Toms off the roost to a blind, they are bold and receptive to the call, making for an exciting hunt and leaving you wanting more. Rolling hills, deep valleys and lots of timber make The Outback a premier sporting area for the beautiful Merriam Turkey. There are hundreds of the prestigious fowl that inhabit this area year round with many that show up for the breeding season. The Outback provides a perfect setting for the Archery Hunter who is almost guaranteed a tag when applying through South Dakota's Game Fish & Parks Department. Western Ranch Outfitters offers some of the best big game hunting in South Dakota for mule deer, whitetail, antelope and turkey. Book a hunt with WRO and let us show you what we are talking about. The ranch is located on the south side of the White River in Tripp and Lyman counties, approximately 25-30 miles of river frontage plus acres of river breaks above the White River/Missouri River and includes miles of native grass interspersed with cropland and food plots for wildlife to winter on. Yearly new Trees are planted to increase and thicken the shelter belts.